The air operated motor JP-AIR 1 made of aluminium is a compactly built, robust explosion-proof air operated motor in accordance with the latest explosion protection guidelines ATEX 2014/34/EC, category 2. The pneumatic motor is explosion-protected according to Ex 2 GD c IIC T6 (80°C) X and has a type-certificate IBEX U05 ATEX B007 X. 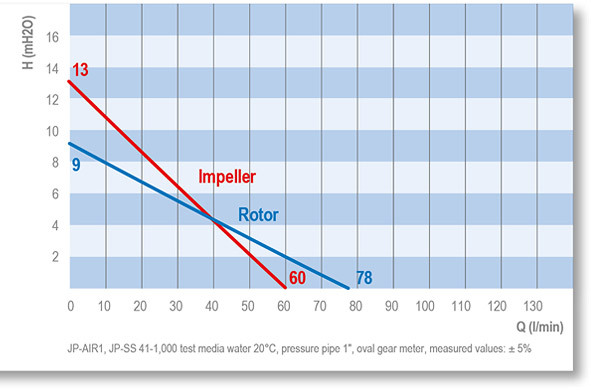 The motor JP-AIR 1 provides beside other air operated motors and the electric motor JP-400 maximum safety when pumping flammable media or for use in hazardous environments. At such applications for the drive motor and the pump tube separate approvals acc. 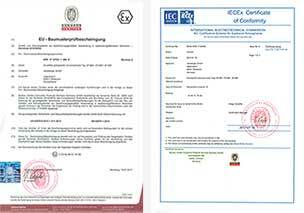 to directive ATEX 2014/34/EU are required and a potential equalization has to be installed. 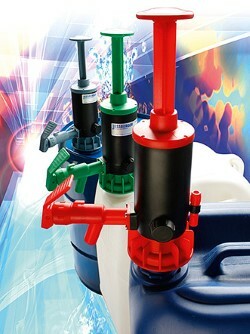 The handy and powerful device (2.1 kg) can be used as a drive for the laboratory pump tubes (not Ex-certified) or in hazardous areas for the ATEX certified sealless pump tubes made of stainless steel (Ø 41 mm), the mixing pump tubes in stainless steel, the stainless steel pump tubes with mechanical seal or complete drum emptying function. In combination with ATEX certified pump tubes, the drive is suitable for many low-viscous, neutral, slightly aggressive media and especially for highly flammable media with a flash point below 55°C. Its sophisticated, technically clear structure ensures an efficient and safe use when transferring the wide range of media. The very robust aluminium motor housing ensures a good chemical resistance when aggressive solvent vapours are present. The speed of the motor can be controlled by means of a ball valve, which regulates the air supply and thus adjusts the flow rate according to the requirements of the user. The air operated motor is supplied with a silencer and a ball valve at the air inlet for controlling the compressed air and thereby the motor speed. The maximum density of the media is for the explosion-proof air operated motor JP-AIR 1 1.3, the maximum viscosity 400 mPas. 300 Watt at max. 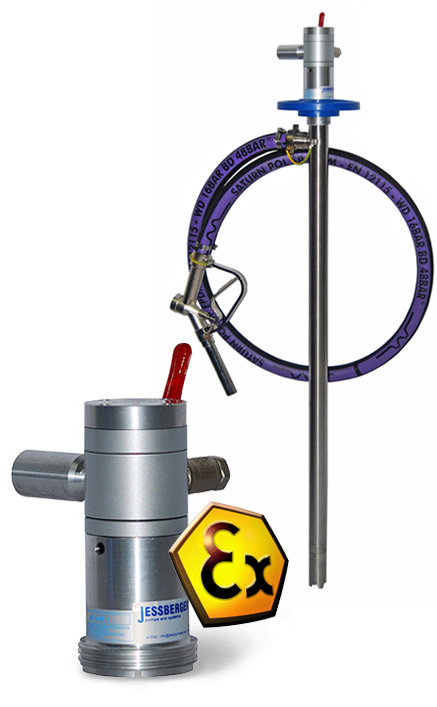 6 bar operating pressure,with silencer and a brass ball valve for control compressed air.